The duty free and offshore financial island of Labuan is located just 5 miles from the Sabah mainland, 62km from Kota Kinabalu, at the northern mouth of Brunei Bay. It’s a three hour boat ride from Kota Kinabalu and just one hour from Brunei. There are fringing coral reefs around Labuan and the smaller islands to the south but Labuan diving is all about Labuan wrecks, these are what the divers come for. The Blue Water Wreck is named because the visibility on the wreck is normally good at 10-40m. The original name of this wreck was Mabini Padre. It was a Philippine registered fishing trawler that caught fire and sank in 1981. It now lies 20km from Labuan Island, off the north east coast of Kuraman Island, on it’s port side in 35m of water. The shallowest part of the wreck is in 24m. 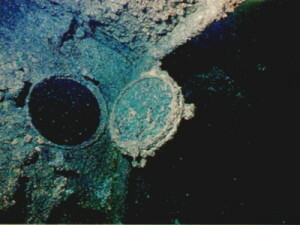 The wreck is 80m long and penetration is possible in several places. The propeller is still visible at the stern. The upper side of the wreck is covered in soft corals and encrusting coral and barnacles are slowly covering every inch of steel. Schools of snapper and barracuda are resident on the wreck. The Cement Wreck or Tung Hwuang sank on 25 September 1980 when it hit Samarang Bank. It was transporting cement to Brunei for the Sultan’s new palace but had been sent back as the cement was considered substandard. The wreck now lies 13km east of Labuan Island. It is 92m long, 15m wide and 7.5m high. It sits uprightand intact in 30m of water. The main deck is at 19m and the wheel house at 14m making this dive site suitable for all levels of diver. Although visibility can often be low on the wreck there is a mooring line for descents and ascents and navigation is easy around the superstructure. Penetration is possible in places although care must be taken with exposed steel edges, fishing nets and silting. The easiest areas to penetrate are the cargo hold and the crew quarters. The engine room is increasingly more dangerous to penetrate as the wreck begins to collapse. Marine life on the wreck is prolific. Colourful soft coral, sponges and feather stars cover much of the superstructure. Thousands of scorpionfish make touching the wreck anywhere a risky business. Lionfish are numerous. Schools of snapper, jacks, barracuda and other reef fish are everywhere. Even turtles can be seen on the wreck occasionally. The Australian Wreck is located about a mile away from the American Wreck. She has a confusing history. Originally the Dutch ship SS De Klerk she was thought to have been sunk by the Royal Australian Air Force, hence the given name, but was actually scuttled by the Dutch in 1942 at Tanjong Priok in the face of advancing Japanese forces. In 1943 she was raised by the Japanese and renamed Imabari Maru. In 1945 while travelling between Singapore and Manilla she hit a mine and sank again. 339 passenger lost their lives when she sank, 308 workers, 26 comfort women and 5 Japanese soldiers. The wreck is 85m long and 12m wide. She now sits on her port side in 34m of water. The shallowest part of the wreck is 25m deep. The huge blast hole from the mine is visible on the starboard hull. Most of the wreck is now just a steel skeleton and penetration is easy. Care should be taken due to the vast amount of scorpionfish and stonefish on the wreck. Lionfish are present as are well hidden frogfish and anglerfish. 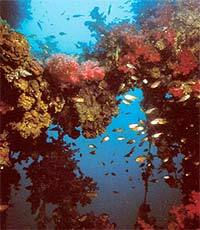 The steel structure is covered in black coral bushes, hydroids and sea whips that are home to myriads of small fish. Large groupers patrol the wreck. The American Wreck, correctly called the USS Salute was a US Navy minesweeper during the second World War. She was originally built in Seattle in 1943 and first saw service in Hawaii in 1944, escorting convoys between Pearl Harbour and far eastern sea ports. Later she would serve as protection for anti-aircraft vessels and submarines as well as minesweeping operations in the Philippines. In 1945 while performing routine mine sweeping operations around Brunei Bay she struck a mine and sank. Nine US sailors lost their lives when she sank. She now lies 14 miles from Labuan Island off the south east coast of Rusukan Kecil Islandat Barat Banks. The mine exploded midship and as she sunk USS Salute buckled up and now lies in a jumbled mess of steel at 33m deep. The shallowest part of the wreck is at 18m. The damage caused by the mine is clearly evident. The bow now faces towards the stern. Much of the aft area is still recognizable and the propeller blades can just be seen in the sand. Care should be taken when penetrating the wreck. Live ammunition shells and depth charges are present. Wine bottles, cutlery and shoes are scattered around. Fish life is all over the wreck. Encrusting coral, clams, barnacles and spiny black urchins cover much of the wreck. Scorpionfish and lionfish are numerous. Schools of fish include snapper and sweetlips.